Who’s smoking, drinking, and using drugs? Time perspective as a predictor of substance useBy Keough, Kelli A.; Zimbardo, Philip G.; Boyd, John N. Basic and Applied Social Psychology. 1999 Jun Vol 21(2) 149-164. Present time perspective as a predictor of risky driving. By Zimbardo, Philip G.; Keough, Kelli A.; Boyd, John N. Personality and Individual Differences. 1997 Dec Vol 23(6) 1007-1023. Time Perspective, Health, and Risk Taking. By Boyd, John N.; Zimbardo, Philip G. Strathman, Alan (Ed); Joireman, Jeff (Ed). Understanding behavior in the context of time: Theory, research, and application. (pp. 85-107). Mahwah, NJ, US: Lawrence Erlbaum Associates Publishers (2005) xix, 356 pp. Constructing Time After Death: The Transcendental-Future Time Perspective. By Boyd, John N.; Zimbardo, Philip G. Storm, Lance (Ed); Thalbourne, Michael A. (Ed). The survival of human consciousness: Essays on the possibility of life after death. (pp. 107-126). Jefferson, NC, US: McFarland & Co (2006) viii, 311 pp. Participant Self-Selection Biases as a Function of Individual Differences in Time Perspective. By Harber, Kent D, Zimbardo; Philip G; Boyd, John N. Basic and Applied Social Psychology. 2003 Sep Vol 25(3) 255-264. Validation française de l’échelle de temporalité. 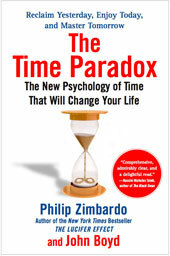 / The Zimbardo Time Perspective Inventory (ZTPI). By Apostolidis, T.; Fieulaine, N. European Review of Applied Psychology/Revue Européenne de Psychologie Appliquée. 2004 Sep Vol 54(3) 207-217.